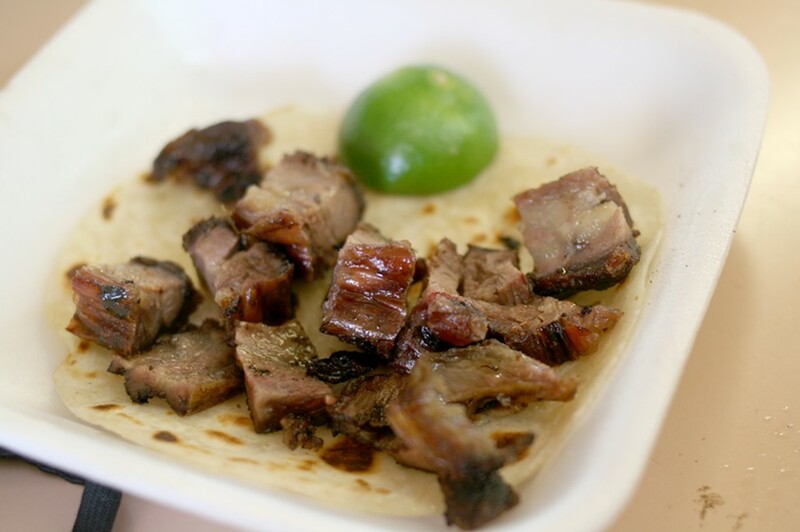 Heather Hoch Tacos Apson’s costilla de res taco might not look fancy, but it tastes phenomenal. Open: Monday – Saturday: 10 a.m. to 10 p.m., Sunday: 12 p.m. to 10 p.m.
Pros: Tacos, tortas and burros filled with meat so cheap and delicious that they don't need salsa. Cons: The salsa could use some help. Down in South Tucson beneath the junction where the I-10 and I-19 split, there’s a little taco shack that centers everything it does around a grill. The grill at Tacos Apson really is a thing of beauty. Crusted and black with years of grease and animal fat burned on, there are layers of thinly sliced beef steak, whole ribs and more constantly rotating on and off the fire. On the griddle, piles of tripe are seared, popping and cracking as they cook. Needless to say, Tacos Apson is not the kind of place you take your vegetarian or pescetarian friends. The moment you step out of your car in the partly-paved parking lot there’s an unmistakable smell of meats grilling—a guarantee of what’s to come. “One tripa and one costillas taco, please.” Smile, meet them halfway and they’ll give you what you want. Not so hard, yeah? I mention those two tacos outright because they quickly became my favorites. I’m insanely picky when it comes to tripe. When not prepared properly, the innard meat can be texturally chewy, slimy and off putting and the flavor can taste like, well, the lining of a stomach. At Tacos Apson, the tripa is damn near perfect every time. It’s so crispy on the outside, you’d swear they deep fried it. On the inside, it has an almost creamy texture. 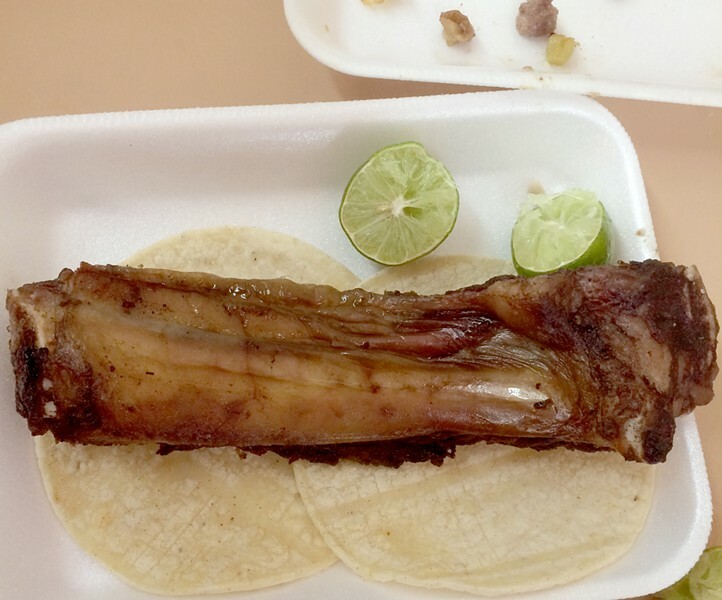 The costillas taco, on the other hand, is a much less delicate dish. One grilled and charred bone-in beef rib sits on top of two tortillas. It’s one of the most beautifully rustic and honest dishes I’ve ever seen—it looks like something out of the “Flinstones,” sure, but it tastes juicy, smoky and satisfying. Just be sure to ask for a knife so you can shave off pieces of the meat to wrap in your tortilla. All of the tacos at Apson can be accompanied by either flour or corn tortillas, both of which get a turn on the griddle for a little browning. Inside you’ll find a salsa bar with five salsas, whole jalapenos, carrots, onions, cilantro and more. While the salsas leave something to be desired in terms of freshness and originality, they’re honestly not even necessary. Since the folks at the taqueria really make cooking meat the emphasis of the shop, tacos are ready to eat and delicious with just a squeeze of lime. When ordering, you have your choice of walking up to the window at the patio, but, the best seats in the house are the stools at the counter inside. Think of an old Western saloon where you can holler at the barkeep for another shot of whiskey. Apson’s counter is like that, but with tacos. 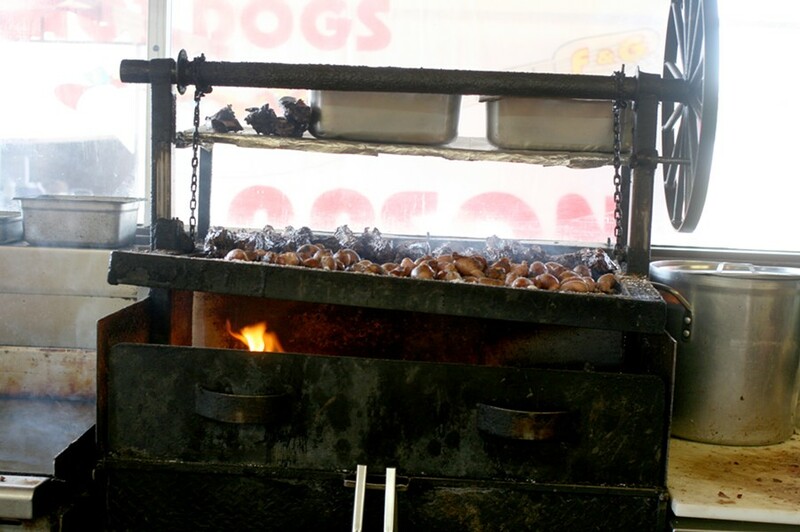 You may start by ordering two or three at the counter but soon you’ll find yourself calling out for more and more as you watch them grill up meat right in front of you. If that’s simply a sales tactic, I’m on board—it’s fun and the tacos come out lightning quick. 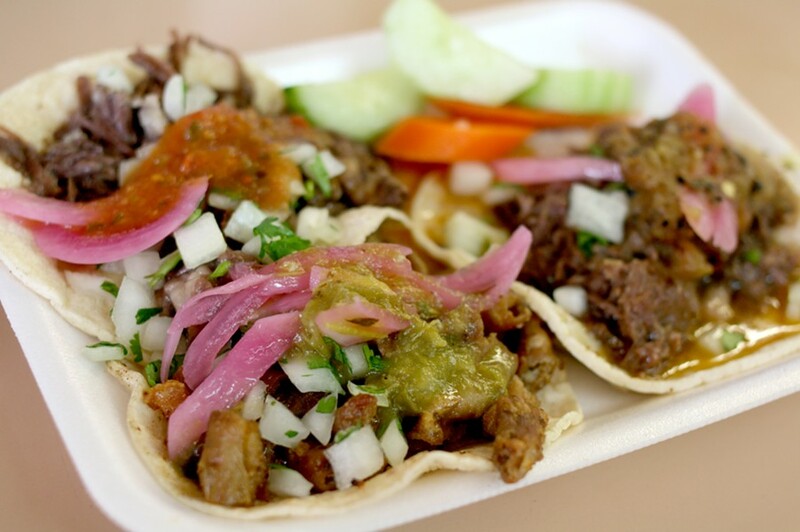 Other notable meat fillings include the marinated pastor, salty barbacoa and juicy lengua. Be warned that the cabeza, while totally worth a taste, may or may not have tiny bits of what I can only assume was cartilage based on the texture—not a huge turn off for offal aficionados who delight in sucking marrow from bone, but something to keep in mind if you’re a bit squeamish. The Apson and hass tacos offer meat smothered in melted cheese and green chiles, plus mushrooms if you opt for the Apson. If you’re really a brave offal eater, the menu also offers huevo becerro criadillas. My dining companion asked the man behind the counter, “Es que los testículos?” to which he responded, “Si.” In terms of what to expect here, think Vienna sausage texture with a slightly squeaky bite. Then there’s the taco chino: a messy griddled bean taco that gets its flavor from the grill as much as any of the meats do. For those nursing a hangover, this greasy treat comes highly recommended. But, there’s also the option of burros and tortas for many of the filling options if you need that extra carby push. For cheese lovers, quesadillas and caramelos offer griddled tortillas with melted Oaxaca cheese and carne asada if you ordered the latter. They also serve a gringa, which is a quesadilla with pastor. While it sounded delicious, I felt like a self-fulfilling stereotype ordering one, so I stuck with the caramelo. One unexpected star at Tacos Apson are the beans. Served as a side with three tortillas, the beans obviously have a bit of grease in them from the looks of it. They also have a heavy dose of seasoning and a long, slow cook time, which makes them viscous and absolutely delightful to pile in tortillas and munch on between taco orders. A small handwritten sign in the corner of the small taco joint says “hay flan.” Yes, they have flan, and, yes, you should most definitely get it. When you buy flan at a store, chances are that you’re buying some sad, Jello-like imitation of the classic Mexican dessert. At Apson, the flan is thick and custardy, almost like a bread pudding, with browned edges and a richly sweet caramel on top. Perhaps the best part of Tacos Apson, aside from the authenticity and attention to stellar meat preparation, is the price. Tacos range between a dollar or three and burros and tortas are $6 or $7, so, even if you find yourself at the counter ordering another and another and another taco, you’ll leave having spent only about $10 or $15. Even attempting to rack up a bill there is a challenge, but one I am happy to keep attempting time and time again.